Welcome to the Badge Art Contest page! This contest requires that you design four separate badges: an attendee, staff, guest, and artist/vendor badge. We will vote on the best set of badges and the winner will get free admission, a guaranteed artist or vendor table, and a free Jaycon T-shirt (and I have it from a reliable source that they will be pretty cool this year!). If you are not interested in the table, you have the right to defer that prize for another of the same value. PLEASE READ THE FOLLOWING SECTIONS VERY CAREFULLY!! Each badge must be exactly 4”(wide)x 2.5”(tall) in size! This dimension fits our lanyard holders, so double-check the size of your files before you send them! 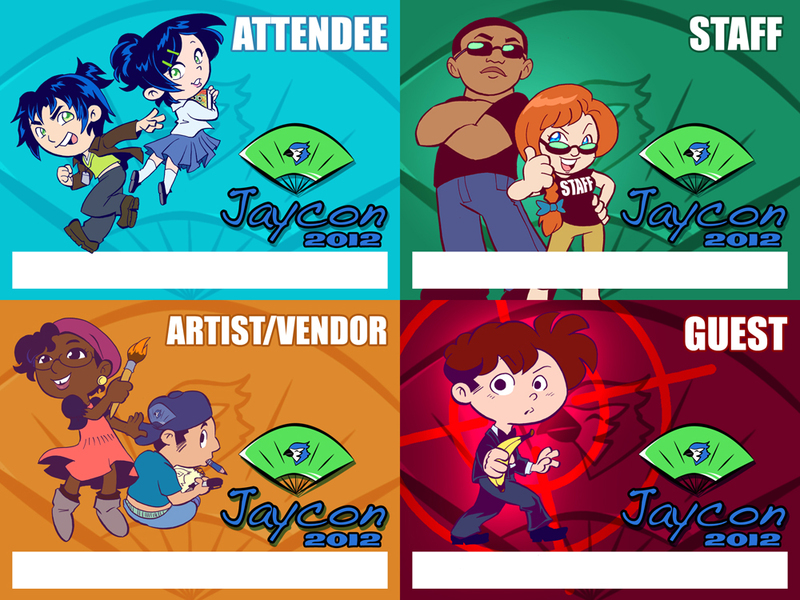 Although you can use a combination of any mediums to make the Jaycon badges, all badges must be submitted electronically as either a PSD (if it fits), PDF, or JPEG file! We will accept original copies of badges through mail! Please let us know if this is how you would like to submit your art, and we will send you an address to mail them to as soon as possible. You have freedom to choose the layout for the badge, but you must allot space in your badge for the Jaycon logo, the label for the type of badge (attendee, guest, staff, or artist/vendor), and a space for people to write their names! 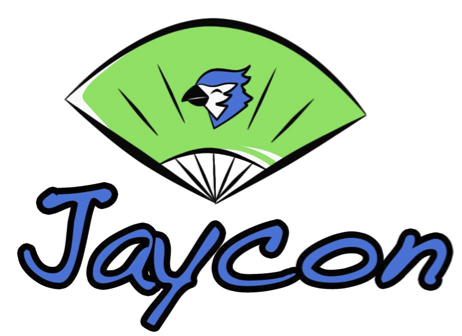 The file for the Jaycon logo can be found at the bottom of this page. 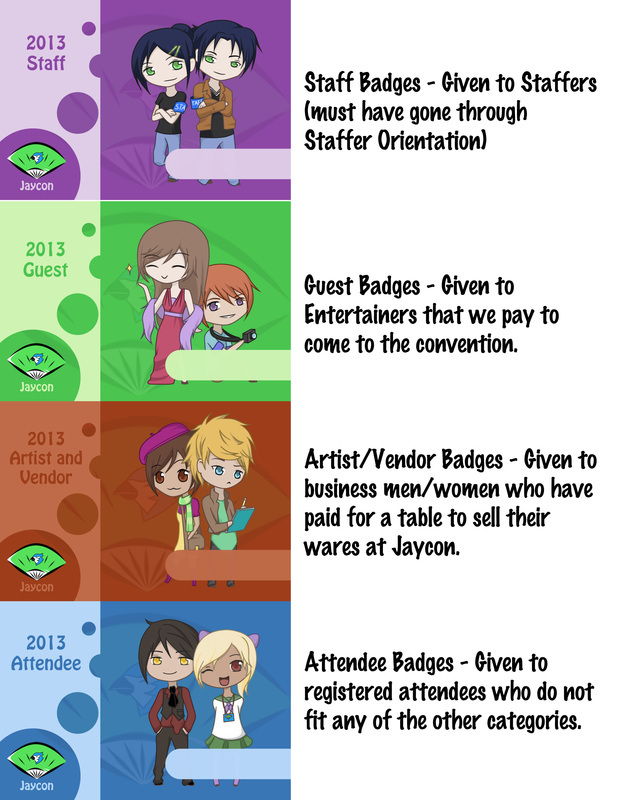 To help you out, I have included badge examples from previous years to show different types of layouts that work. Until the winner for this contest is chosen, we ask that you refrain from posting the final draft of your work onto any websites or blogs (facebook, deviantart, tumblr, etc.). The reason for this is because if your work is chosen, people can access these files and possibly make fake badge copies. We don’t want any trouble from the college having people come to the convention that shouldn’t be there, so this is a safety measure! Posting rough drafts is fine, but otherwise please wait until the winner has been announced to post your work!! Please submit a PSD (if it fits), PDF, or JPEG file of your badge designs and your full legal name to animeclub@etown.edu or the by the deadline. IMPORTANT! The deadline to turn-in your badges is no later than March 1st 2016 at 12:00 AM! You will be given several months to do this, so any submissions after this date will not be considered. Don’t lose your chance! Engrain this deadline in your brains! You can turn your submissions in as early as you like. PLEASE NOTE: We reserve the right to reject any submission that does not follow the about rules or appropriate deadlines. 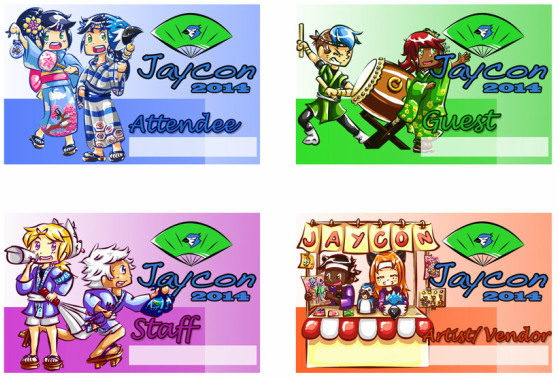 The Jaycon mascots are the twins, Kouta and Midori, should be on at least one of the badges. They can be found on the Staff badge of 2013 and the Attendee badges of 2014 and 2012. They can also be seen in the chibi art throughout the website and in the header at the top of every page on this website. They have blue-black hair and green eyes. Kouta is somewhat grumpy and apathetic and Midori is a cheerful, happy-go-lucky character.